"Optimizing Infrastructure for Hybrid Data Center Strategies"
Hybrid data center strategy is the need of the hour for the companies that are pursuing the opportunities business and IT has to provide. A hybrid infrastructure consisting physical data center both on-premise and hosted facility of the highest competence will provide the maximum data center efficiency to the company. IT leaders are always responsible for IT service levels, regardless of the location of the data center. A full-featured Data center infrastructure Management (DCIM) solution improves the efficiency of hybrid infrastructure and enhances the IT leader’s visibility and control over the infrastructure. 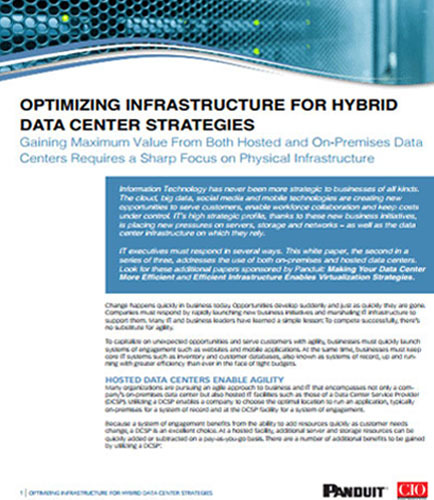 On-premise data centers will increase business agility. Data Center Service Provider (DCSP) is cost effective in nature and reduces the overall expenditure on IT infrastructure. The IT leaders of a company have to maintain the contractual responsibility of DCSP to enhance data center performance. DCIM is essential to maintain electrical power, pace conservation, thermal risks, and assets. The data center industry is going through a change in cabinet color preference for improved aesthetics, work space lighting effectiveness, and cost savings due to decreased lighting requirements. Lighter colors for the cabinets reflect more illumination into the room—increasing the overall lighting level. Fewer light fixtures are needed and resulting in a lower continuous lighting power load. Panduit Corporate Research & Development conducted a series of computer simulations to determine the impact of aisle containment systems and vertical exhaust ducts (chimneys) on lighting in the data center. Analysis such as Baseline Configuration, Cold Aisle Containment, and vertical exhaust ducts (VEDs) are done on black and white cabinets to find its effectiveness on lighting and cooling strategies. What is the use of cabinet color in data centers? What is the impact of data center lighting and cooling strategy on data centers? What is the future of data center configuration? Move ahead and read the following whitepaper that will address all your questions, including these: Does cabinet color save costs? What impact do aisle containment solutions and vertical exhaust ducts (chimneys) have on data center lighting? Do these solutions change the lighting impact of white cabinets?